Mayor Sean O'Reilly in Springvale. 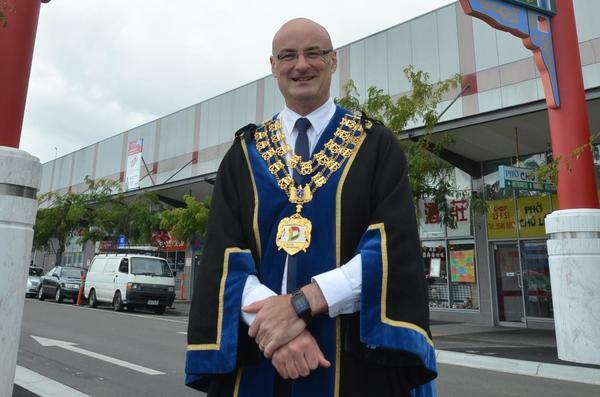 GREATER Dandenong needs to lock in and share a strong vision for the years ahead, according to Mayor Sean O’Reilly. Cr O’Reilly joined civic and business leaders from more than 100 cities at the Asia Pacific Cities Summit and Mayors’ Forum in Brisbane from 5 to 8 July. “It was a really forward-thinking conference,” he said. Speakers included London Olympic and Paralympic Games organising committee chairman Lord Sebastian Coe. “He was talking about how when the vision is communicated to everybody – and that includes the residents, our businesses in the City of Greater Dandenong and worldwide – then no-one’s unclear on what the direction is and everybody can contribute towards it,” Cr O’Reilly said. “Some local councils might be reluctant to say too much about long-term plans, because long-term plans can change and then some residents might be disappointed. “But it’s much better to communicate long-term plans to residents so everyone can understand where we want to get to. “A plan can change over time but with no plan there’s no real direction. Cr O’Reilly met with about 75 mayors from across the Asia Pacific, ranging from cities of three million to tiny regional towns. “Every new person I spoke to had something different to say and a different perspective,” he said. He spoke to a delegate from Parramatta in New South Wales. “It’s establishing itself as a second CBD in NSW,” he said. “That is what Dandenong is establishing itself as – an alternate CBD to Melbourne’s CBD. “We need to continue to advocate for transport connections and for the business services that make it attractive for businesses rather than go to Melbourne. Cr O’Reilly said there were quite a few presentations on technology. “We’ve got a lower technology literacy rate than other municipal areas,” he said. “We want to have programs that don’t leave residents behind who aren’t on the internet. “But also the trend is that a lot of people’s first computer is a mobile phone, so how does the council get more of its information out through mobile devices? “We also had a presentation on 3D printing. “This is going to be a huge manufacturing trend over the next five years. “While it won’t be cost-effective to mass produce using 3D printing, any parts that need to be customised with a low-production volume will be done using 3D printing technology. “It’s not just plastic, you’re also seeing metals being used. Cr O’Reilly also heard about new ways to communicate information to residents. “For example, our council could provide detailed technology map on parking spaces and then residents could use that when they’re planning trips,” he said. “You can foresee not too far away that you’ll actually have parking maps that are real-time, that will actually show you which parking spaces are occupied and which aren’t.